Help her when necessary, and praise her for her efforts and independence. The tween and teen years are the important years in instilling confidence in our young, impressionable girls. Girls go through tremendous emotional and physical changes during puberty. How can you help raise your daughter to be confident? It’s important that parents encourage high self-esteem as they transition to womanhood. Teenage girls today are likely more challenged to maintain a positive self-esteem than their parents’ generation. Our society and the media are putting such high standards on girls to be “perfect” and to “fit in”. So how do we help raise confident daughters? Here are some tips to empower our girls and help to raise confident daughters. But don’t praise girls only on how they look – parents’ praise should be focused on efforts and accomplishments rather than physical appearance. By complimenting her talents and abilities, you will help build her self-confidence. Don’t only focus on looks; praise her personality too. “You looked so poised at the dance recital,” or “your smile lit up the stage,” rather than praise her on how beautiful she looked. When you praise your teenager for their behavior and actions, it boosts their confidence and encourages them to do even better next time. Show your daughter what it means to be confident and happy with her own appearance. If you look at yourself in the mirror and utter negativity about the way you look, it affects your daughter too. If you love yourself and your body and are open about these feelings, your daughter will also follow suit. Treating others with respect and showing kindness to others is one of the best ways a daughter can learn from her mom. Make sure you’re also not judging others by appearance; show your children that it’s what’s inside that makes us who we are. Live by example. Want to reinforce the beauty in strength? Encourage strong role models – whether it be a family member, teacher, someone in your daughter’s community or other women with admirable achievements. Reading books or watching movies with strong female characters another way to encourage strong role models. It can also be helpful to have a discussion with your teen daughter about the unrealistic images in magazines and social media. Talk about the fact that magazine photos are altered to make women look thinner and more flawless than they actually are. 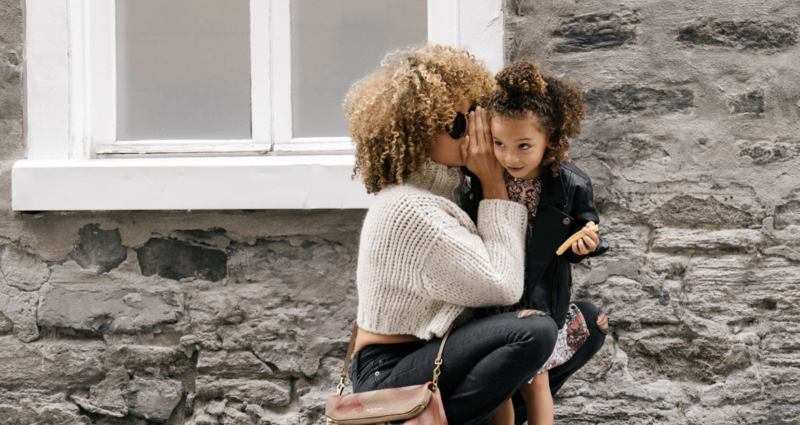 Allow your daughter to lead the conversations and listen. Encourage her to talk about what’s going on in school, with her friends, or even about what’s playing on television and what images she sees in media. Have open and frank discussions about relationships, body image, appearances and peer pressure, as well as how girls are portrayed in media. Most importantly, have respect when she speaks to you; always treat their worries and troubles with importance. Even if you don’t agree with your teen’s perspective, try and avoid criticizing as much as you can. Don’t pigeonhole her into a gender box. Encourage your girls to try sports, which play an important role in developing a positive body image, discipline and self-assurance. Team sports also prove to be great opportunities for learning about success, failure, teamwork, and facing challenges. When talking with preteen girls about the importance of exercise, keep the message simple: strong is beautiful. If your daughter isn’t into sports, try encouraging her to become involved other extra-curricular activities, or school clubs. Having her be involved in something apart from school and friends will teach her positive team spirit, and help her learn about working together towards a common goal. Give your daughter the space and confidence to complete her homework, chores or other tasks and responsibilities. At the same time, show interest in your teen’s school life and academics; attend school events, and check in on homework too. Remember to tell your daughter that she can achieve anything she sets her mind to. Help her when necessary, and praise her for her efforts and independence. Your goal as a parent is to give your teen daughter all she needs to grow up into a self-sufficient, strong and independent woman. Maria Lianos-Carbone is the author of Oh Baby! A Mom’s Self-Care Survival Guide for the First Year, and publisher of amotherworld.com, a leading lifestyle blog for women.